The study unveils the PGC-1α gene as a critical factor in maintaining bone-fat balance in the bone marrow. 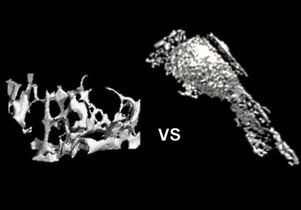 In aged and osteoporotic bone, the amount of PGC-1α decreases dramatically, leading to less bone and more fat formation in the marrow cavity. Until now, the PGC-1α gene, a gene activator, was primarily known to regulate reactions that convert and sustain energy for human cells. The study — led by Dr. Cun-Yu Wang, chair and professor of oral biology and medicine, and Dr. Bo Yu, assistant professor of restorative dentistry, both from the UCLA School of Dentistry — has shown that PGC-1α may actually impact whether stem cells turn into fat cells or bone marrow cells and in turn control the bone-to-fat balance in bone marrow. Wang and Yu noticed in both human and mouse bone marrow that the expression of the PGC-1α gene decreased dramatically with advanced age. The researchers initially wanted to better understand the role of this gene in age-induced bone loss. The pair began their study by creating a mouse model that had the PGC-1α proteins removed from mesenchymal stem cells. They found something unexpected when these mice underwent a procedure that simulated osteoporosis — there was a significant increase in marrow fat along with the expected decrease in bone mass. To test their findings, they created a mouse model in which the PGC-1α gene expression was increased. 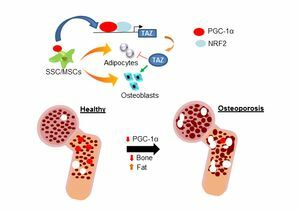 What occurred was the opposite of what happened with their first model — there was a slowdown in bone loss and a decrease in bone marrow fat, which suggests that PGC-1α may play a protective role in maintaining the bone-to-fat balance. 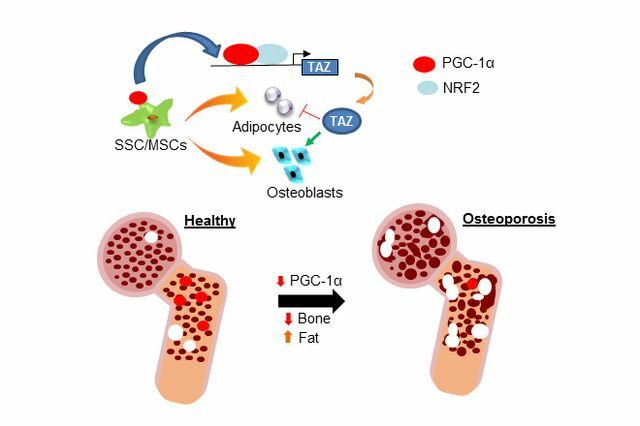 The team found that PGC-1α directly activated the expression of TAZ, a master regulator previously reported to promote bone formation while inhibiting fat cell differentiation of mesenchymal stem cells. Physical exercise has been found to induce PGC-1α expression. This study also suggests that regular physical exercise might help to maintain bone health and prevent skeletal aging, as well as provide other health benefits.